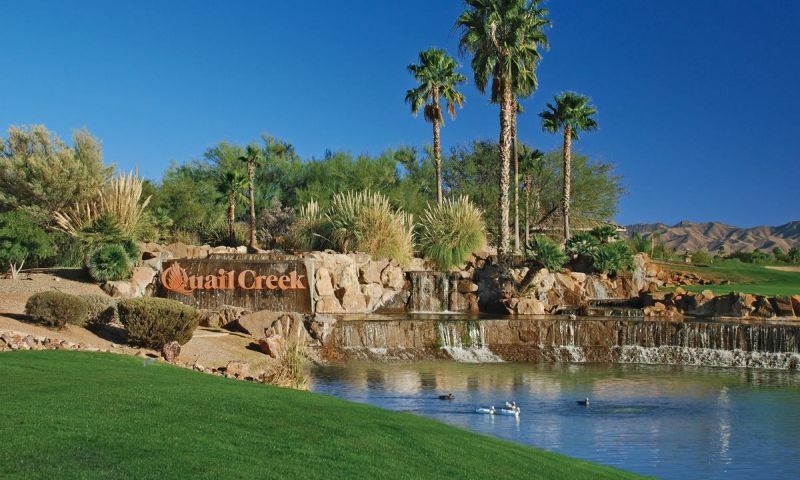 Quail Creek is a gated active adult community in Green Valley, Arizona. Developed by Robson Communities, Quail Creek offers an envious lineup of resort-style amenities in multiple facilities for recreation and entertainment. Residents enjoy living in a private community that offers numerous clubs and activities, championship golf courses, and lifelong learning. While a certain percentage of Quail Creek welcomes homebuyers aged 40 and over, this active adult community is primarily targeted towards residents age 55 and older. Quail Creek encompasses modern single-family homes that offer single-level living and low-maintenance exteriors with picturesque mountain views. In Quail Creek, residents enjoy an exciting lineup of amenities. Spread throughout the grounds, one will find R.V. parking, parks and natural space, horseshoe pits, fishing lakes, and a dog park. The Madera Clubhouse is the central hub for social activity in the community. It includes a grand ballroom with a stage, multi-purpose hobby and activity rooms, lounge, library, and coffee bar. Golf enthusiasts are greeted with 27 holes of championship golf at Quail Creek County Club. The three 9-hole courses wind through high Sonoran desert terrain with the nearby Santa Rita Mountains providing a majestic backdrop. These southwestern-style course are to provide a memorable round of golf for players of all skill levels. After a challenging round of golf, residents like to gather at the Quail Creek Grill or Oasis Lounge for great food and drinks. Robson has long been known for their quality construction practices and attention to detail. At Quail Creek, homebuyers can choose from a wide variety of single-family floor plans that range in size from 1,376 to 2,686 square feet. There are both new construction and pre-owned resale homes available for sale. Some homes include granite countertops, built-in wall ovens, kitchen islands, cultured marble showers and optional three-car garages. Beautiful views of the golf course and nearby mountains are available but the picturesque scenery tends to come at a premium. Quail Creek is quietly tucked away from the hustle and bustle of Green Valley, Arizona. Residents of Quail Creek cherish the solitude of their community situated six miles east of I-19, Green Valley's main thoroughfare. It is separated from the majority of Green Valley's neighborhoods by a pecan grove and several miles of open space. Despite the somewhat remote location of Quail Creek, it is only a ten-minute drive to a majority of the 300 shopping, dining and retail outlets in Green Valley. Plus, Tucson is only 30 miles north, where residents can access many shopping and cultural attractions. There are numerous outdoor amenities spread throughout the grounds of Quail Creek. There are plenty of activities available in Quail Creek. Here is a sample of some of the clubs, activities and classes offered here. Robson offers a select collection of attached, single-level homes. These models range in size from 1286 to 1529 square feet and feature two bedrooms and two bathrooms, as well as a two-car attached garage. The Tradition Home Series offers ranch single-family homes that are between 1,376 and 1,965 square feet. These homes offer two to three bedrooms, two or two-and-a-half bathrooms, and an attached two-car garage. The Premier Homes Series offers single-family homes that range from 2,051 to 2,541 square feet in size. This collection offers two to three bedrooms, two-and-a-half bathrooms, and a two-and-a-half-car garage. There are many den options as well. The Estate Home Series offers the largest single-family homes with 2,686 square feet of living space. The one model offered by Robson provides three bedrooms, a den, three-and-a-half bathrooms, and a three-car garage. The den can be converted into a fourth bedroom. I call this the gateway to heaven. We moved from Washington State where it's beautiful, but rains all the time. Retired from airline industry. I could live anywhere and here is where I want to be. Lots to do. Have not found the 55s yet. Quail Creek is our own private paradise in the sun. It is a friendly little oasis in the sun. We feel safe, friendly, well respected and care is taken to meet our needs and desires. We have a restaurant with romantic ambiance, spectacular views, casual lunches, a fabulous lounge "where everybody knows your name. The food is extraordinary. There's a wide variety on the menu and daily specials. We have a new pastry chef who creates decadent desserts and pastries at the morning coffee bar. We have breathtaking views of the mountains and golf course. We have 2 country club pools surrounded by palm trees and waterfalls. We have golf, a magnificent athletic center with new state of the art equipment, and activities for every level of ability. All different card games, dance clubs, tennis, bocci, horse shoes, plays, musicals, shows, entertainment, speakers, painting, sculpting, glass design, pet clubs, walking, bicycling, roller blading, and every activity our hearts desire. All this in our own back yard, gated community. They are always busy maintaining and improving our grounds and facilities. Our homes are places we enjoy and reflect our personalities. I have never been happier. It really is the best place to retire. 55places.com is not affiliated with the developer(s) or homeowners association of Quail Creek. The information you submit is distributed to a 55places.com Partner Agent, who is a licensed real estate agent. The information regarding Quail Creek has not been verified or approved by the developer or homeowners association. Please verify all information prior to purchasing. 55places.com is not responsible for any errors regarding the information displayed on this website.